I feel as though I’m cheating a bit with choosing this to make for the Secret Recipe Club. There really isn’t a recipe for this and actually, I don’t think you could find something easier to do. But, I love gummy bears, I had some half used tiny liquor bottles in the fridge, and we were having a party. 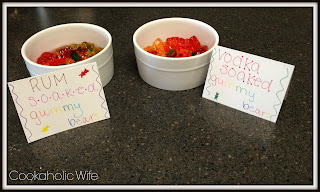 It only seemed right to combine all three of those things together and make Drunken Gummy Bears as my choice for this month’s Secret Recipe Club. What is the Secret Recipe Club, you ask? It’s a large group of bloggers, broken out into 4 smaller groups and each month the bloggers are secretly assigned another blog to make a recipe from. Then on our designated reveal day, we all share our recipes with the help of a link up. For this month I was assigned to Cheap Ethnic Eatz. Evelyne is the author of Cheap Ethic Eatz, which she started back in 2007. She lives in Montreal and created this blog as a way to record the reviews of restaurants her meetup group (of the same name) visited. Although the group no longer exists, she still shares recipes. I think that is really cool. Like she says, there are so many of us who eat the same foods over and over again and don’t branch out to try new things simply for the fear of the unknown. Even I am guilty of this so it was really neat for me to read through her recipes and think whether it was something I’d be willing to try or not. 1. 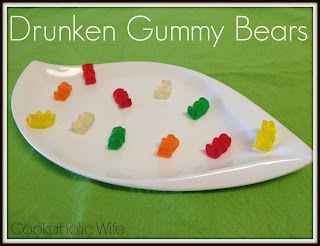 Place gummy bears in a ramekin or shallow dish. Pour at least 1 teaspoon of your desired liquor choice over the gummy bears. Let soak for at least 1 hour before serving. I opted to use two of the Haribo packages of gummy bears, which I believe are about 10 ounces each. I used about 2 teaspoons of whipped cream vodka in one dish and one 1 teaspoon of Bacardi rum over the other dish. The whipped cream vodka ones were quite delicious. The rum ones were a little too strong for my tastes. But either way, if you are looking for an alternative to jello shots and an adult version of something from your childhood, I highly suggest making these. It’s becoming a bit of a tradition in my family to soak something in alcohol and serve it at parties. It all started with the vodka soaked cherry tomatoes my aunt served at my bridal shower. Believe me, you haven’t lived until you’ve had a vodka soaked cherry tomato. Or a vodka soaked gummy bear for that matter. Those gummi bears look so cute. These would be great for a party, you can do the same with cherries as well. Delicious! I have never heard of such a thing! Sounds like a fun, Halloween treat. Okay this cracked me up, but it's a really good idea. I follow Evelyn's blog too.